Hi, please shutdown Emby Server and install from the website on top of your existing version. You're coming from a really old version so right after updating you most likely will need to run a library scan, and if you have any plugins installed, make sure to install the latest versions of those plugins. Thanks. Hi Emby, I'd like to ask for your help. We're not able to update Emby Server hosted to our Windows Server. We're not able to update emby server which is hosted in our Windows Server. Even if we have downloaded the latest version and was advised to restart after, still the update failed. What are the other steps we can do to update our Emby Server? 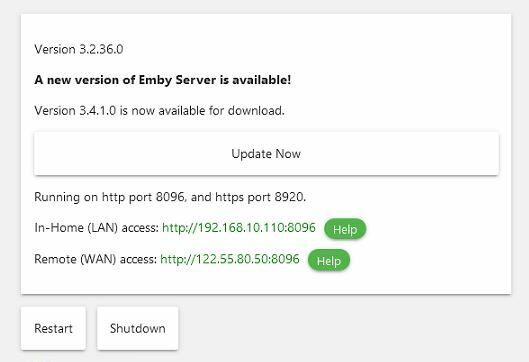 Hi, Emby Admin I'd like to raise a concern regarding with installing the emby server application from the website to have the latest update thus Installing the new application overwrite or delete the movies we have in the library? Hello @Luke after 4 or 5 updates in beta's, leaving the server on auto and restart after update on auto, it doesn't work. You kindly answer me in other post doing this same thing. After the first question and 4 or 5 updates later the installation trying to install over and over. I fix that unchecked the auto download updates and auto restart after, now i do the updates at hand. Hi. This is a known issue with the current beta. There is discussion on it in the testing area. No problem. Always better to report something if you're not sure. Yes if you are running test builds then please make sure to monitor the testing area of the community. Thanks.